Horse Illustrated serves hands-on horse owners by promoting the best in horse care, riding, and training. It?s the premier monthly source of all-breed, all-discipline equine information ? including expert English and Western training advice, competitive insight, important medical updates, comprehensive coverage of equine health and nutrition, as well as breed profiles, news, and lifestyle features for equestrians. Barn Buzz: A humorous look at the life of a horse enthusiast. Inspiration: Readers nominate the unsung heroes that have inspired them. Trail Guide: Tips, news, and your questions about trail riding answered. English Arena: Tips, news, and your questions about the English discipline answered. Western Roundup: Tips, news, and your questions about the Western discipline answered. Vet Files: Your horse health questions answered by our expert veterinarians. Parelli Secrets for Success: Advice to improve your relationship with your horse from world renowned trainers Pat & Linda Parelli. The Life of Dr. Riley: DVM Laura Riley shares lessons from her life with horses. Features: Each information-packed issue features articles like in-depth training articles for all disciplines, special-interest features, comprehensive health care and grooming articles, breed profiles and expert advice offering new and current horse owners tips on taking care of their horse. Recent feature topics include: "10 Steps to a New Trailer", "Better Barrel Response", "Holistic Healing", "Healthy Pasture", "4 Fences, 7 Ways", "Wound Care", and "Handling the Problem Horse". The lifestyles of the Horse Illustrated editorial staff mirror those of our readers. Being horse owners themselves, editors and contributors are dedicated to providing quality coverage of the equine world. Contributors are experts in their field and include authors, trainers and veterinarians: Sharon Biggs, Pat & Linda Parelli, Annie Eldridge, Cindy Hale, Toni McAllister, Jennifer Nice, Laura Riley DVM, and Dale Rudin. Horse Illustrated is information driven. Feature articles are complemented by beautiful four color photography. "How To" articles include helpful step by step photos or illustrations. Each breed profile comes with a gorgeous pull-out poster. Horse Illustrated has the industry's most comprehensive editorial. 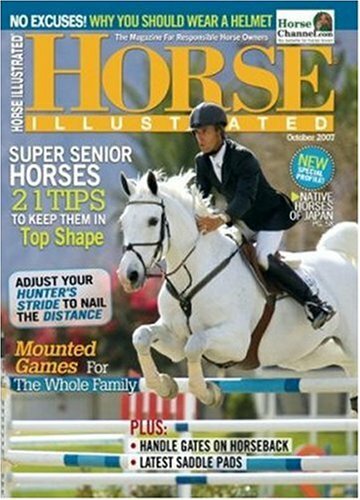 Readers turn to one publication - Horse Illustrated - over other "niche" publications for a wide range of special columns and features instead of buying three separate magazines to cover English riding, Western riding, and health care. Comprehensive coverage of equine health, nutrition, grooming, and all aspects of horse care helps keep your horse in top shape. Everyday training difficulties, sporting across the world, medical milestones, and functional equestrian fashion; you can expect to find it all in Horse Illustrated. Advertising is relevant to the magazine, offering products and services that all horse enthusiasts will be interested in. An Ad Index is included in each issue featuring the page number of the advertiser. The United States Equestrian Foundation, the national governing body for equestrian sport in the United States, has recognized Horse Illustrated for excellence with a Pegasus Award for Media as Equestrian Publication of the Year in 2004 and following up with an honorable mention in the same category in 2005.